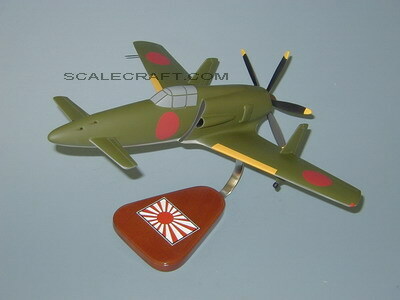 The Kyushu J7W1 Shinden (“Magnificent Lightning”) was a World War II Japanese propeller-driven fighter. It had an unusual design, with wings attached to the tail section and stabilizers on the front. Its propeller was in the rear in a pusher configuration. The Shinden was developed for the Imperial Japanese Navy as a specific response to the B-29 Superfortress raids on the Japanese homeland. It was expected to be a highly maneuverable interceptor, but only two were finished before the end of war. It was the only World War II aircraft of canard configuration that any combatant ordered into production. Captain Masaoki Tsuruno was the creator of the Shinden. A member of the Technical Staff of the Japanese Navy, he envisioned a radical design to counter new Allied aircraft with superior performance over existing Japanese types and believed a turbojet engine would propel the ultimate Shinden. In 1945, the first of two prototypes was finished. It had a very powerful armament for that time, and its engine was mounted backwards inside the rear half of the fuselage. In an unusual move dictated by the urgent needs of the war, the Navy ordered production of the all-metal Shinden even before the first flight. They planned to produce 150 aircraft each month at two production plants. On August 3, 1945, the strange-looking Shinden took to the air for the first time with Captain Tsuruno as pilot, after many delays due to the lack of critical parts and engine cooling problems. He flew the aircraft two more times, on August 6 and 9. The war ended six days later. The total flying time of the Shinden was approximately 45 minutes. Kyushu also delivered a second prototype but it never flew. The company was troubleshooting the design and laying out the turbojet-propelled version when the war ended. Mahogany wood. Wingspan 19 1/2 inches, Length 16 inches.